In stock 4.5 Volt 2A AC/DC Switchmode 9 watt miniature wall mount regulated power supply, with rare 4.5V, 2000ma DC output from PowerStream. 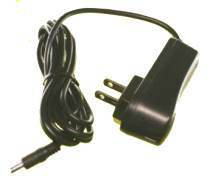 Hard-to-find wall plug Universal AC regulated switchmode 4.5 volt power supply, 2000 mA, double insulated. .This is a compact, high quality, switchmode 4.5V regulated power supply with stable output, 9 watts continuous. It has a fixed AC plug and a barrel connector output.